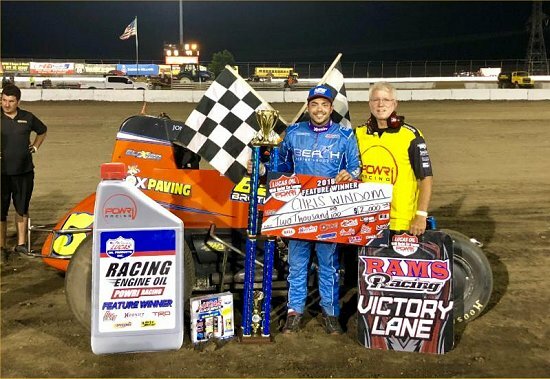 JOLIET, IL (June 30, 2018) - Illinois native Chris Windom took home the POWRi Lucas Oil WAR Wildcard check and trophy at the Dirt Oval at Route 66 Raceway Saturday night. Brady Short and Korey Weyant completed the podium. Brady Short and Korey Weyant led the field to green with Weyant leading lap one. Short threw the slide job in turns three and four to get by Weyant and lead lap two, but Weyant would returng the favor in turns one and two to regain the lead. Meanwhile, Chris Windom was working his was forward from his fifth starting position. Soon, WIndom was trailing second place running Brady Short. Once Windom got by, he set his sights on the leader, Korey Weyant. Windom would throw the slidejob on Weyant and clear him to take over the lead half way through the main event. The main event went green-to-checkered with zero cautions, and WIndom would go on to pick up the victory plus the $2,000 payday over Brady Short, Korey Weyant, Mitch Wissmiller and Landon SImon rounded out the top five. The POWRi Lucas Oil WAR Wildcard Sprints are back in action Friday, July 20 at the Champaign County Fairgrounds in Champaign, Illinois. The POWRi Lucas Oil WAR Sprints take on a 2-day weekend up next. Friday, July 6 the WAR Sprints are at Belle-Clair Speedway in Bellevillle, Illinois followed by Saturday, July 7 at St. Francois County Raceway in Farmington, Missouri.